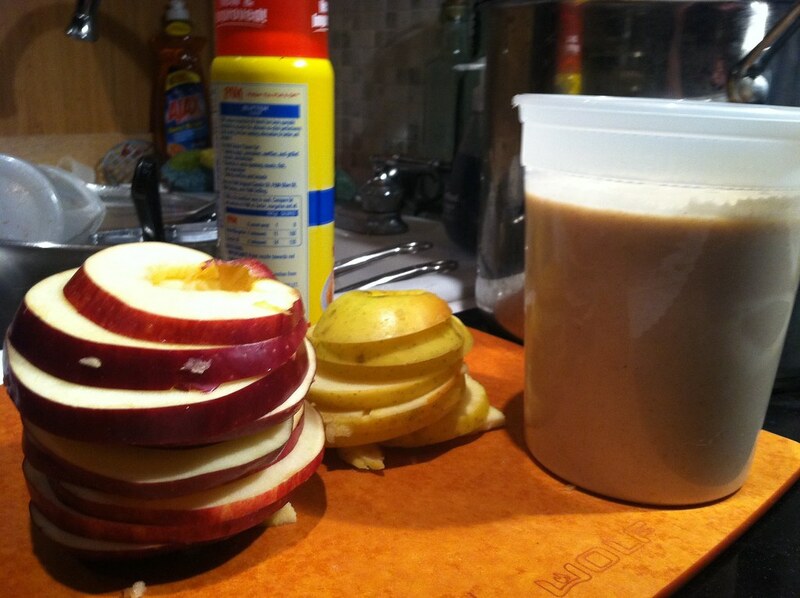 apple ring pancakes! 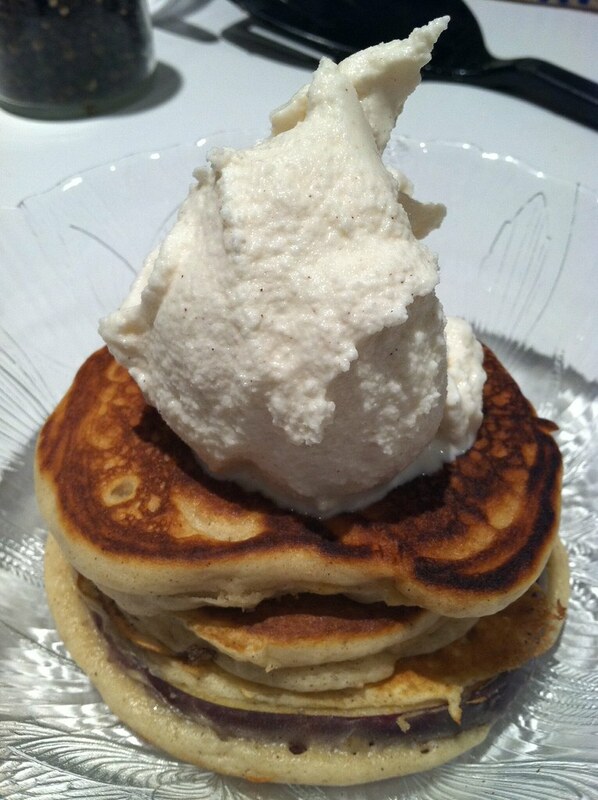 with cinnamon almond ice cream! – ugly food tastes better. 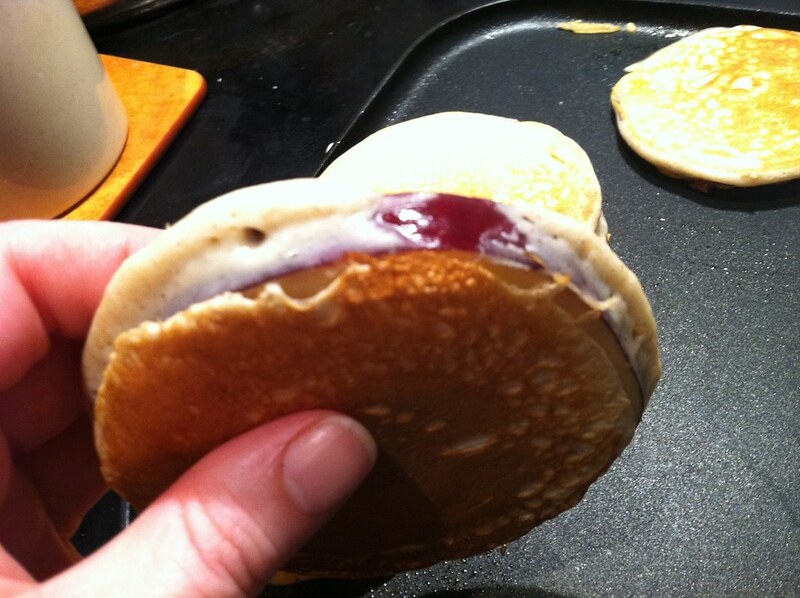 The first thing my mother taught me how to make when I was a little girl was pancakes. Every Saturday morning I would wake up and help her make the batter. I was always getting in to trouble for literally crushing the eggs. We were on the phone the other day talkin’ about my CSA stuff, and how many apples I have/am going to have. I am the only American that hates apple pie. I usually just eat them raw. She suggested I cute them in to rings and dip them in a spiced pancake batter. Genius! It was all I thought about all week, and then I made them this weekend, a big batch to be breakfast for the week. So easy! I made the batter while I was cooking pie attempt #2 in practice for The Brooklyn Kitchen’s upcoming pie contest. More on that later. First make your batter. 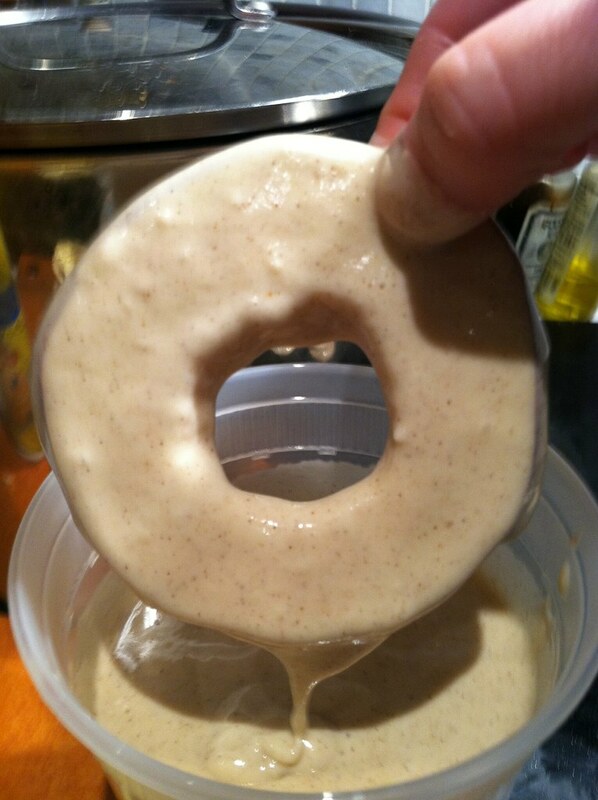 Mix the wet in one bowl, the dry in another, then combine and whisk until smooth. Then prep your station as above, with spray Pam, or whatever fancy thing you use, and start to heat your skillet. 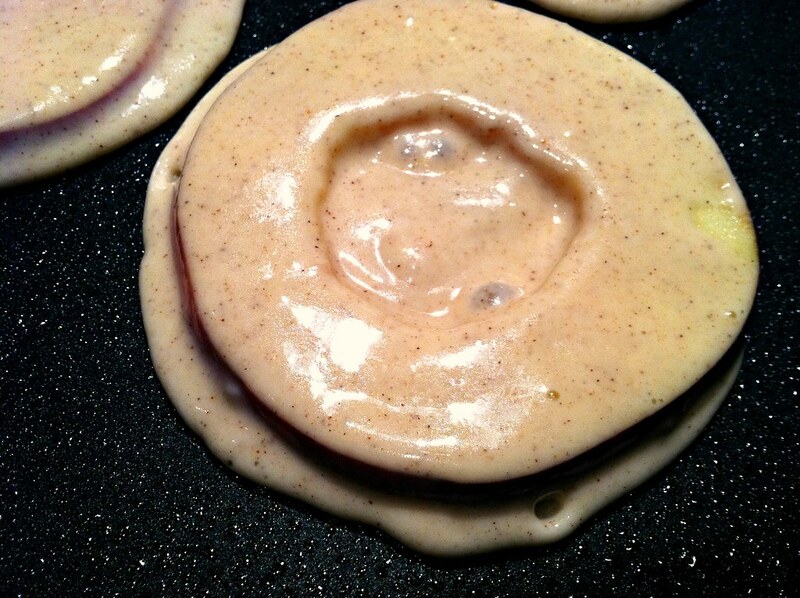 When it is at a medium high heat, start dipping your rings and placing on the skillet. Cook a minute or two on each side, until they are golden brown. Set aside on a tray, and serve immediately. Now, I am also an American that doesn’t love syrup. 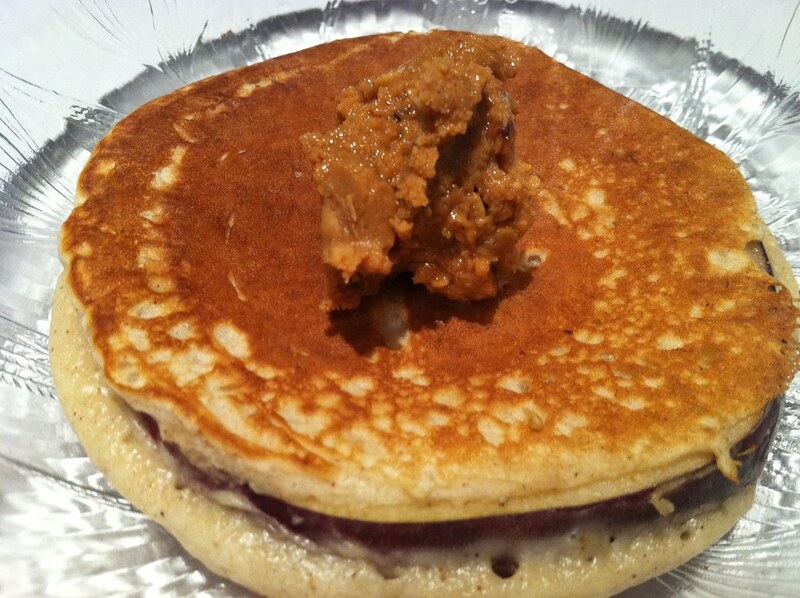 I tend to use pancakes to make peanut butter and jelly sandwiches. These are great for that. In this case, I made them after dinner, and decided to have them as a dessert. 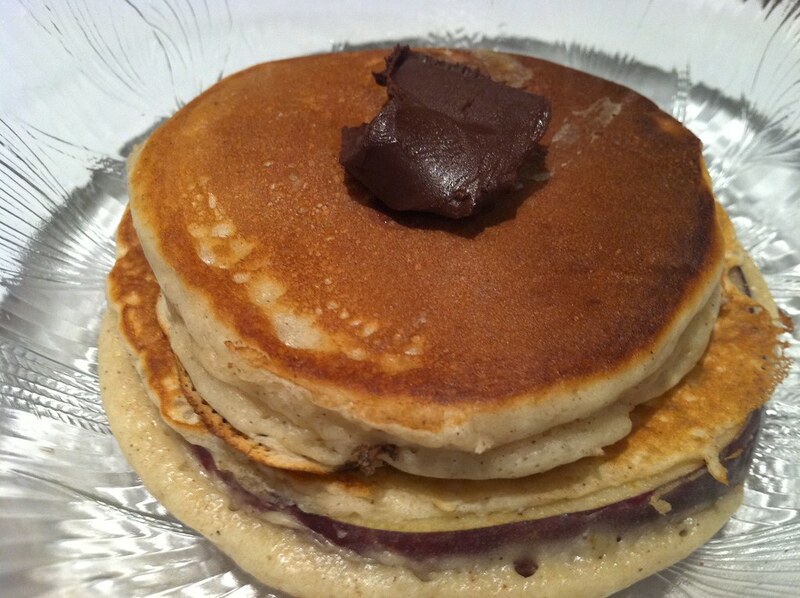 then another with a dollop of chocolate creme i bought in Italy. I put a third ring on top to melt it, and then I decided to take it a step further. I made ice cream while I was making the batter. Cinnamon Almond Vanilla Ice Cream. I used my favorite “not-gonna-kill-ya” vanilla ice cream recipe and used 3/4 tb vanilla and filled the rest with almond extract, and added a tb of cinnamon. I put a dollop of THAT on top. 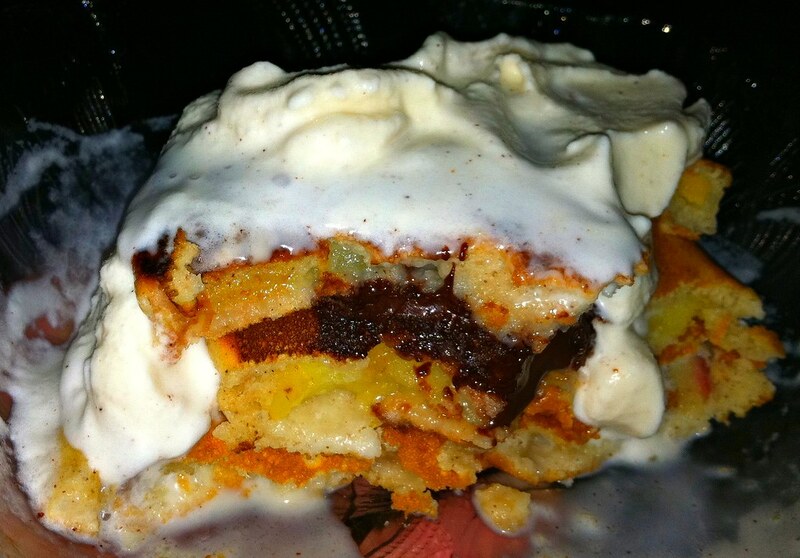 The ice cream melted and spread in to the pancakes, which were warm with delicious melty layers of flavor, and the apples still crisp inside of it all. So effin good! Of course that is also not as healthy, so for the rest of them, they will be put in the toaster and eaten with a little peanut butter, which I think is a great way to start one’s day. And now that I have this glorious recipe, I will be thinking of other things I can dip in pancake batter, cause its so damn easy and good! Thanks, Mom! That sounds pretty much incredible. 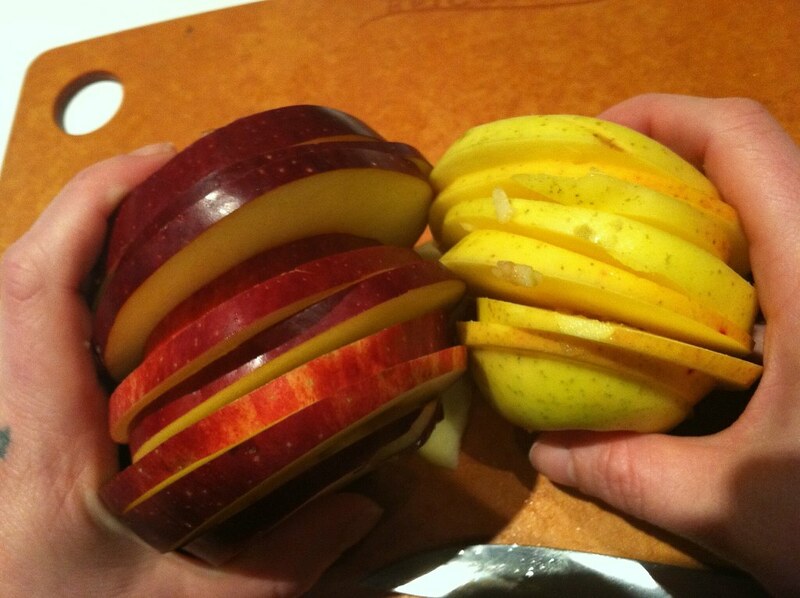 I have about a billion apples sitting at home from my CSA – totally going to try this. I bet they’d be good as the “bread” in little grilled cheese sandwiches too (but then, I’m a big fan of cheddar cheese with apple pie). OMG im totally going to do that! little grilled cheeses! i think i will use brie! and maybe some honey smoked turkey!! Sweet fancy Moses…I’m going to have to have these. NOW. riiiiight? so easy. so good. Karen is a genius! These are SOOOOO good! That is all. Oh, actually, one more thing – I think your spice amounts are a little off… Or, at least for me, one tablespoon of cinnamon would have been WAY too much. Pingback: CSA #18 + Pear Butter | ugly food tastes better.